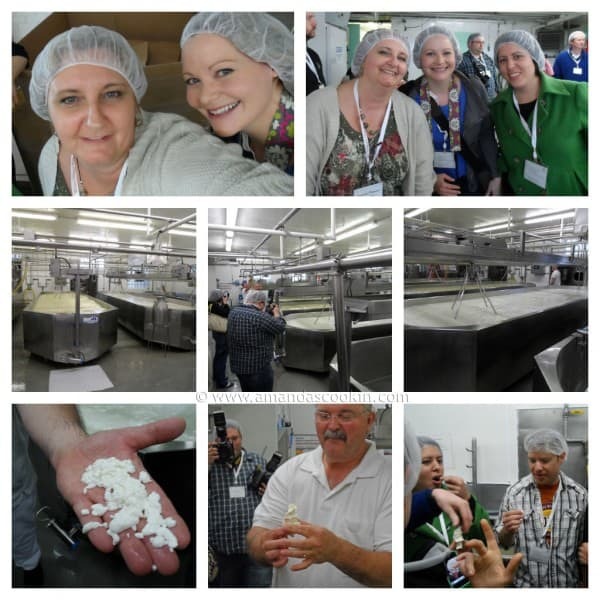 At the beginning of June the Wisconsin Milk Marketing Board invited several Wisconsin food bloggers to tour three southern Wisconsin creameries. June was National Dairy Month, so it was a perfect time to learn more about one of the largest industries my home state has. It all started on a Friday morning. 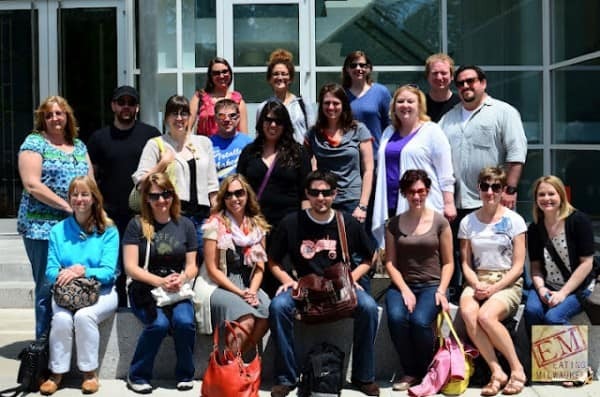 Myself and 19 other Wisconsin food bloggers boarded a bus and headed off into the beautiful Wisconsin countryside, on our way to tour 3 creameries. Our first stop was the Chalet Cheese Cooperative in Monroe, WI, which just happens to be the last remaining producer of Limburger cheese in the United States. Chalet Cheese was founded in 1885 and named for its Swiss heritage. 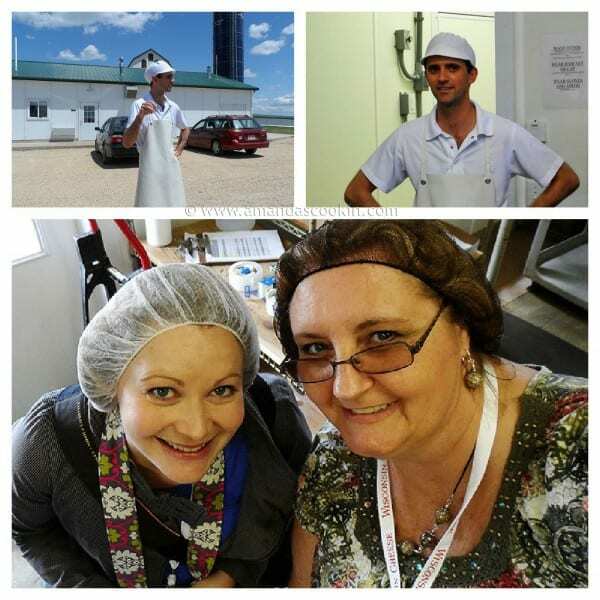 After donning our lunch lady hats :) our personal tour guide Myron Olson, a Wisconsin Master Cheesemaker, showed us around. To qualify to become a Master Cheesemaker, one must be an active, licensed Wisconsin cheesemaker with at least 10 years experience. 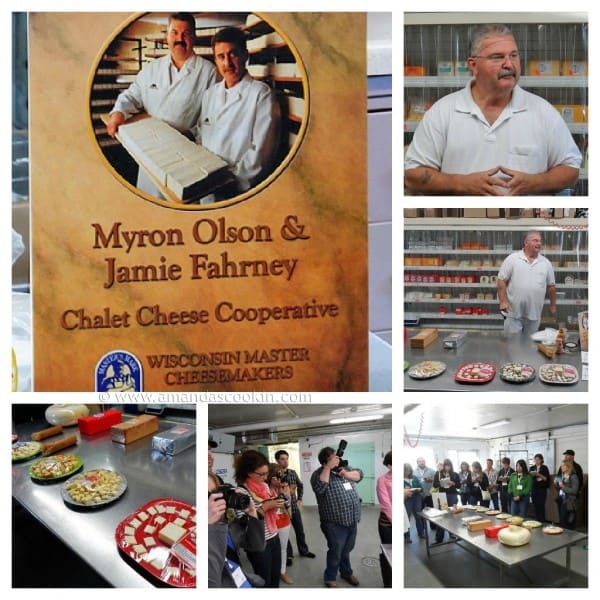 There are currently 47 Master Cheesemakers in Wisconsin. Myron’s passion for his craft really shined through as he proudly talked about the process from start to finish. He’s been at this since 1970 and said he enjoys it so much that he has no plans to retire. He’ll work until he simply can’t work anymore! Myron told us that Chalet Cheese produced 500,000 pounds of cheese in 2011! They have also been featured on television shows such as Modern Marvels, Bizarre Foods with Andrew Zimmeran and Larry the Cable Guy’s show, Only in America. Chalet is the last remaining producer of Limburger cheese. Myron told us that Limburger is a “misunderstood” cheese and that the average Limburger customer is around 75 years old. We tasted it, and while it’s definitely pungent, when paired with some strawberry jam on a cracker it was actually quite good! As we left Chalet to head to the next creamery, I had to take in the beautiful surroundings. Rolling hills and bright sunshine really made the day and location quite picturesque. Our next stop was Hook’s Cheese Company located in Mineral Point, WI. I’m telling you right now that before summer ends I will be heading up to Mineral Point just to take in the gorgeous old buildings and browse the antique shops! I felt like I was back in the cowboy days, the buildings were gorgeous! Tony Hook was our gracious host for this tour and took us through his “cheese caves” (his lovely wife Julie is pictured here as well). Sections of his old building are actually built underground, making for ideal temperatures for storing and aging his cheese. Tony told us that he purchases all of his milk from local farms that are located within a 5 mile radius of his facility. Hook’s Cheese is actually available by me in the coolers of the local mushroom farm market. They don’t offer all varieties, as Hook’s produces quite a long list of varieties, but they do have the 7-year Cheddar. Hook’s actually is quite well known for its 12 ($24/pound) and 15 year ($50/pound) Cheddars and it’s different blue cheeses. On Fridays, customers can come in to Hook’s small shop and buy their cheeses. Getting fresh curd while it’s still squeaking is definitely a treat! We were lucky enough to be able to get some fresh curd as well as sample several varieties. Hook’s also sets up a booth during the summer at the Dane County Farmer’s Market in Madison which I’ll tell you about a bit later. 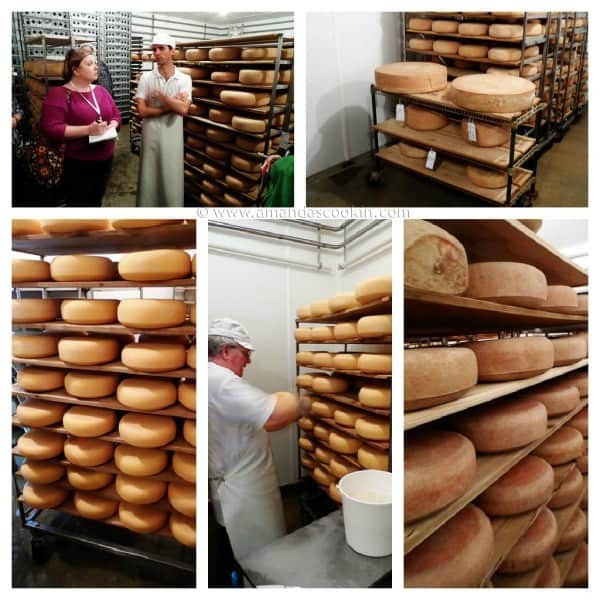 Our final creamery tour was in Dodgeville, WI at Uplands Cheese. Yep, more lunch lady hats. Uplands is a bit more unique than most in that it only produces two varieties of cheese and a limited supply. This is not because they don’t have room to expand, it’s because of their unique approach that was inspired by cheesemakers in the Swiss Alps. 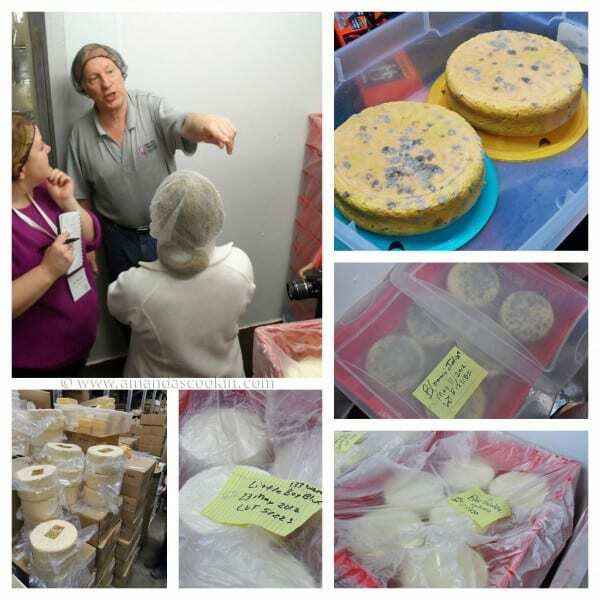 Andy Hatch gave us a tour of his creamery, which is quite small in comparison, but produces big results. The first thing he showed us was his vat, which was connected by pipe directly to the milking area of the barn. In other words, the milk goes straight from their own herd of Heifers and straight into the cheese. You see, Upland’s doesn’t purchase milk, they produce their own. 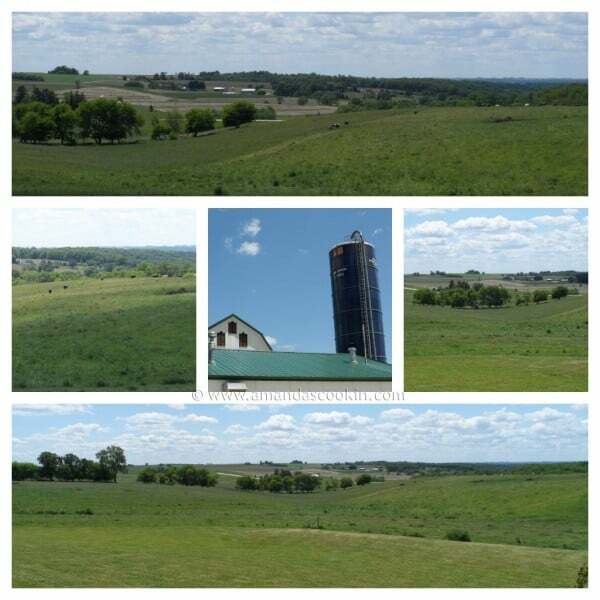 They have a herd of 130 cows which are “rotationally grazed”. Their pastures are broken down into smaller sections and the cows are turned out into a different section each day, rotating from one to the other daily. This rotational process keeps the grass from being eaten all the way down, which in turn keep the grass and clover mix healthy and vibrant. By the time the cows are rotated back to that pasture again, the grass has completely recovered and grown in thick and lush. Something else I found fascinating was that they only produce their cheese during the warm months, the months when the cows can graze. During the months that grazing is not at its peak, the milk produced is sold instead. During the winter months the cows are not milked at all, a more natural process for them. In the spring when they birth their calves, their milk produces again. 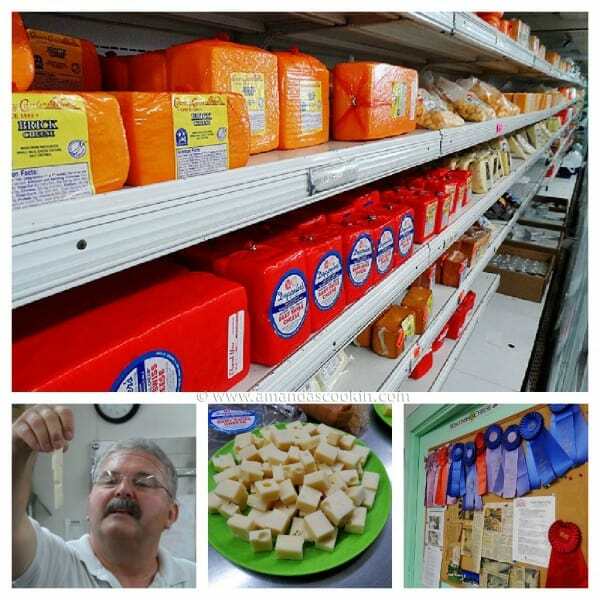 Upland’s has won numerous awards for its sought after cheese, called Pleasant Ridge Reserve. It won “Best of Show” at the American Cheese Society’s annual competition three times within the past ten years. No other cheese has ever earned that accolade. Previously in 2003, it won the same title at the US Cheese Championships. 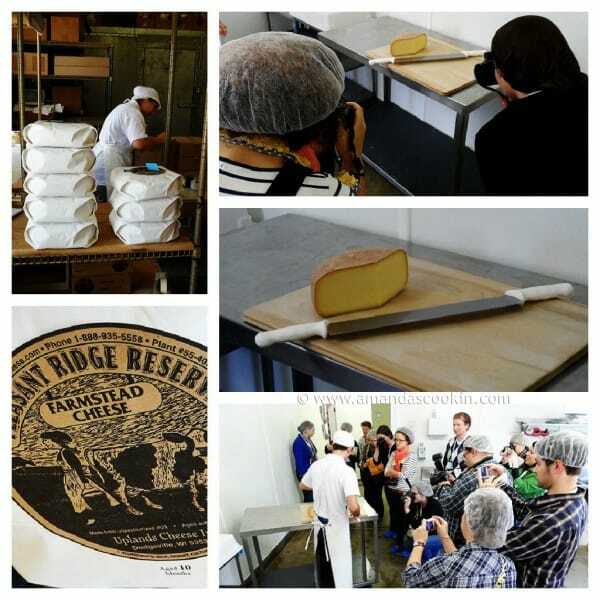 Pleasant Ridge Reserve is the only cheese to have ever won both national competitions. Andy explained that once the cheese wheels are made they are then given a salt rind. Each wheel is hand washed during the aging process. Samples are pulled occasionally to taste test it for readiness. Finally, a sample of the famous cheese! I was excited, and as you can see from the pictures, the paparazzi bloggers were camera ready. As Andy sliced into the wheel he explained that its best to serve from rind to center for 1) appearance and 2) so you’ll be able to taste each variable within the wheel. Did you now that Wisconsin has approximately 18,000 dairy farms and almost 1,300 licensed cheese makers? Both of those numbers are the highest in the nation. 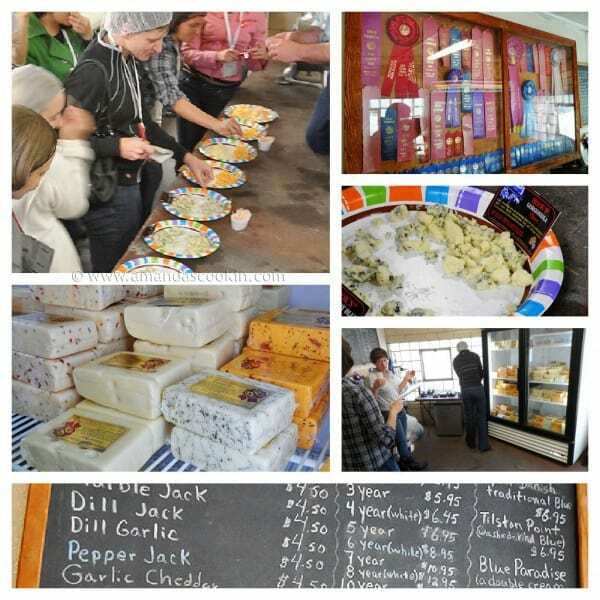 Wisconsin proudly boasts that we have more master cheesemakers than anywhere else on the planet. 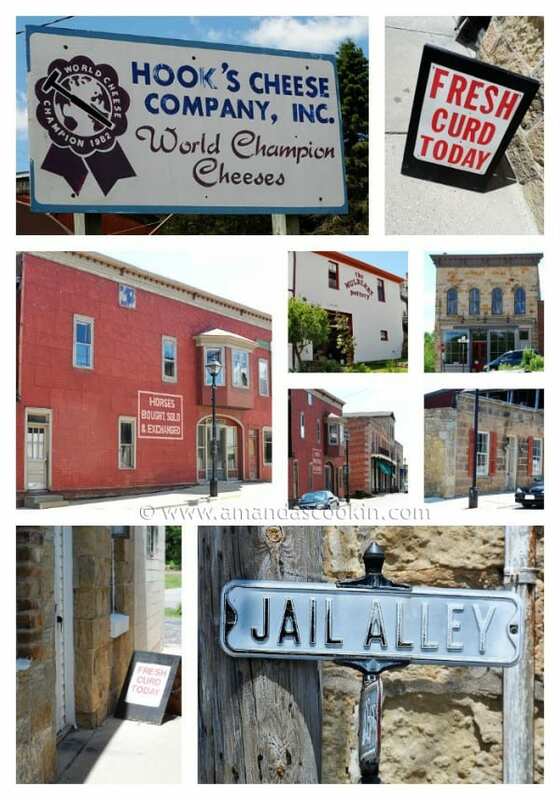 I bet you didn’t know that 90% of the milk produced in Wisconsin goes to making cheese! We’ve also taken home more awards for our delicious cheeses than anywhere else. We are the highest producers of the following cheeses: Mozzarella, Cheddar, Brick, American, Muenster, and yes, Limburger. Wisconsin also leads the nation in specialty cheeses like Asiago, Provolone, Aged Cheddar, Gorgonzola, Gruyere, Gouda and Blue. 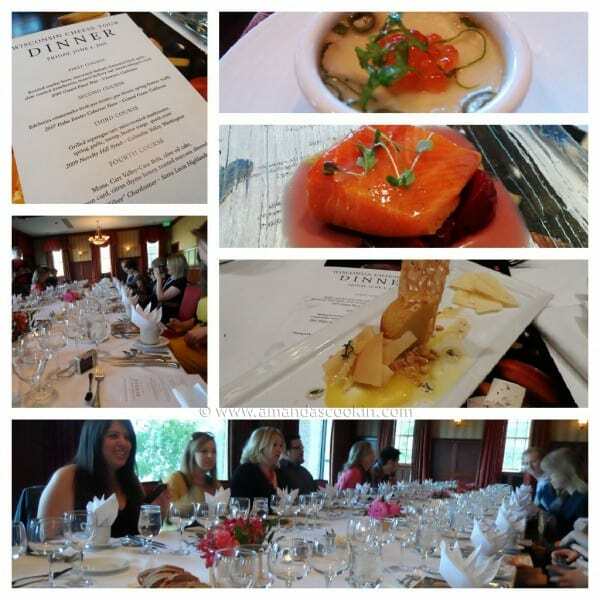 After our tour we were treated to an amazing dinner at The Madison Club. Chef Dan Fox uses only local ingredients, not only from the farmer’s market, but also from local cheesemakers and meat producers. The food was positively delicious, it couldn’t have been a better evening. Cheese producers Sid Cook of Carr Valley Cheese and Bob Wills of Cedar Grove Cheese spoke about cheesemaking in Wisconsin. We also had the pleasure of meeting and chatting with cheese promoter Jeanne Carpenter of Wisconsin Cheese Originals and the Cheese Underground Blog. The following morning I awoke to this gorgeous view from my Hilton hotel room. Breathtaking and what a beautiful day! 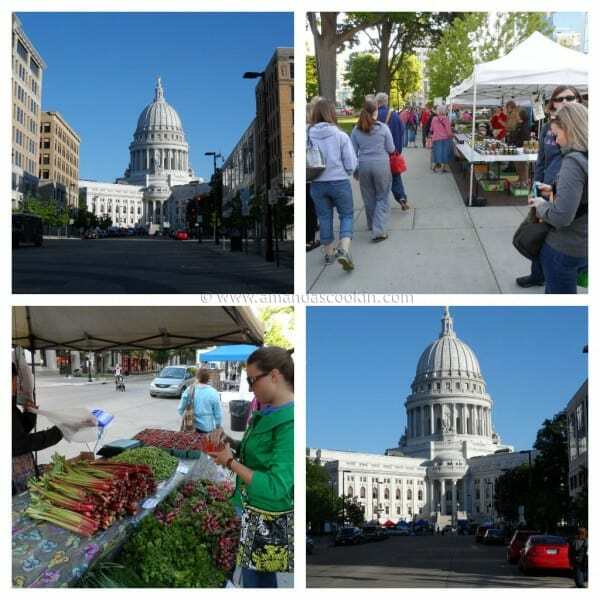 Some fellow bloggers (Karis of Karis’ Kitchen, Alysha of She’s on the Run, and Lisa of Fit in the Midwest) and I got up early to hit The Dane County Farmer’s Market, which is set up around the Capital Building in Capital Square. 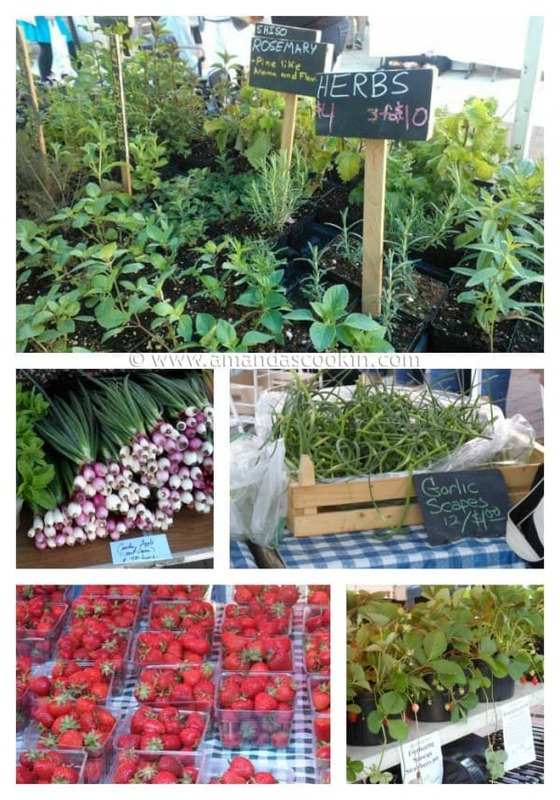 The farmer’s market was positively fabulous and I wish I lived a little closer to Madison! You see, this particular farmer’s market requires that you must be a local producer in order to have a booth and sell there. So everything is grown or made locally. 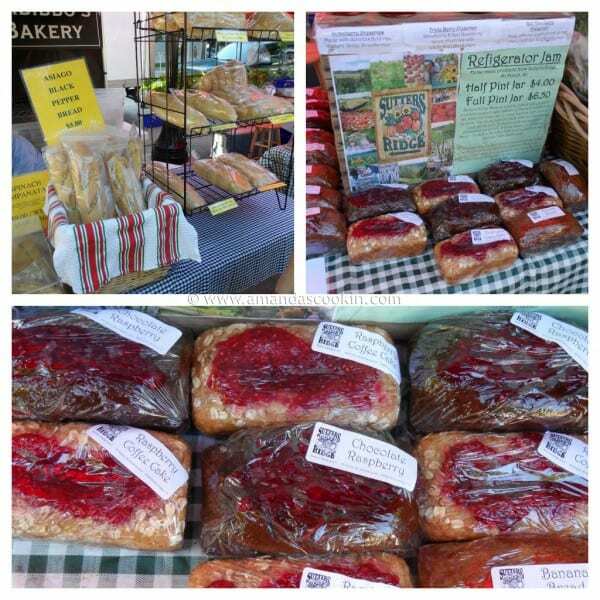 There were quite a few local bakeries and plenty of edible treats ready to be taken home! 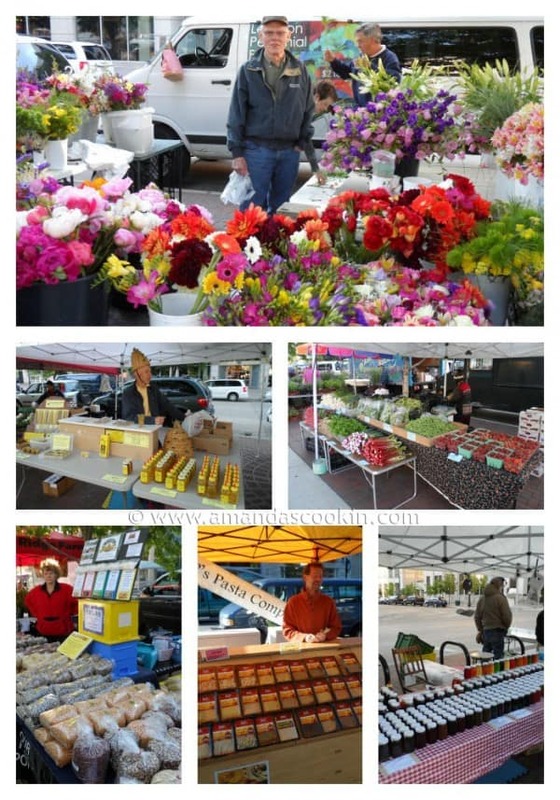 Not only would I love to be able to shop this market on a regular basis, but the city itself is beautiful as well. After the market, it was off to brunch at Graze. Graze is owned by Chef Tory Miller, owner of the famed L’Etoille Restaurant. Graze’s name is indicative of its menu, which is completely comprised of locally grown produce and meats. 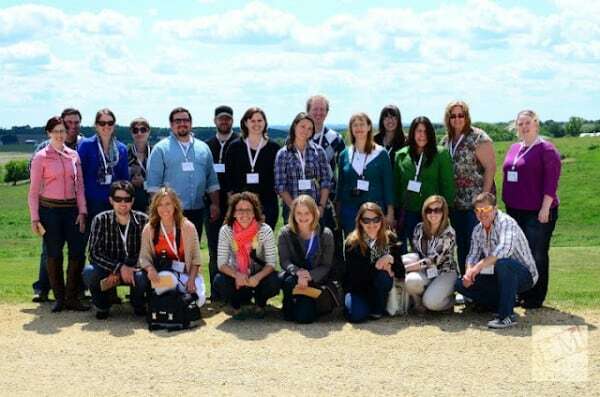 I had a wonderful time and learned so much about cheese and the industry that rocks our fine state. I want to give a shout out and big thank you to Lori and Paul of Burp Blog as they coordinated and organized everything on our behalf. Beautifully orchestrated, thank you! And of course a huge thank you to the Wisconsin Milk Marketing Board for the invitation and for covering the expenses for this great trip. 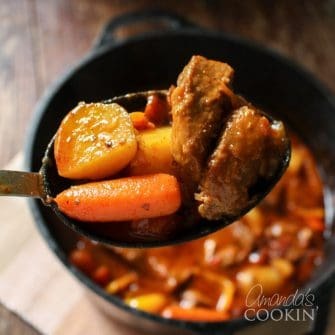 I hope that all of you will stop by and check out some of the mouth watering recipes that they have to offer on their website as well! 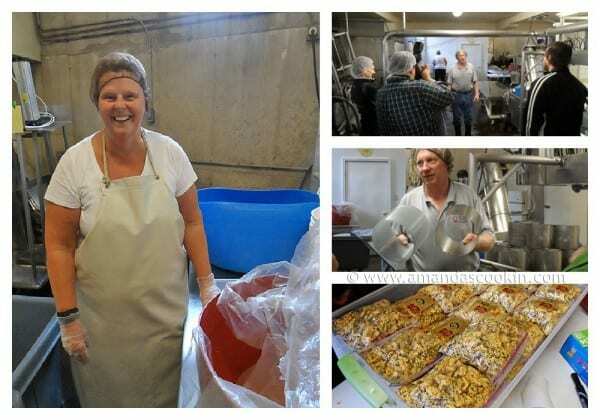 Oh so much fun – i LOVE cheese and would love a tour like this, just fabulous! What a fun trip, Amanda! 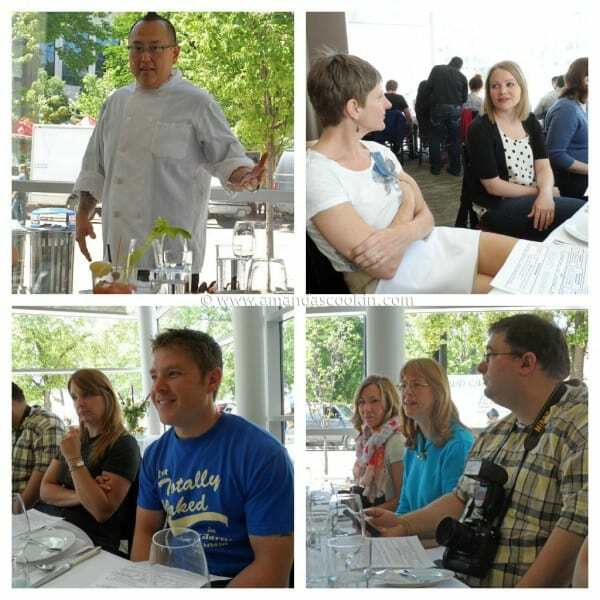 I love learning everything I can about food and I felt like I was right along there with you! Great pictures too! look at that beautiful country side. what a fun tour. just the word “cheese” alone, would make me say yes. i love cheese. that bread looks amazing too! How fun!! I’m on a huge cheese kick these days, so this is would be a little piece of heaven! What a great trip! I love to see behind-the-scenes. And cheese making in the great Midwest? Awesome!!! I love going to creameries and I love cheese!!! Looks like you had a wonderful time. Wow! 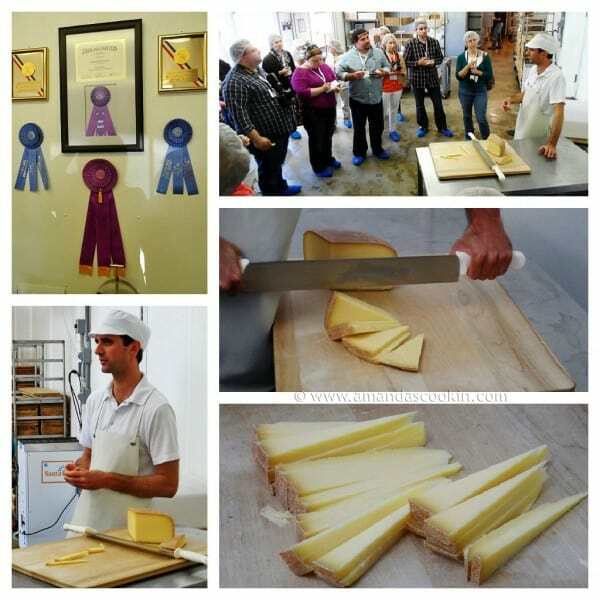 What a great story, wonderful gobs of pictures, and my favorite subject – CHEESE! Wish I could have been there. Looks like you had a great time. And, btw, LOVE those sunglasses on you! 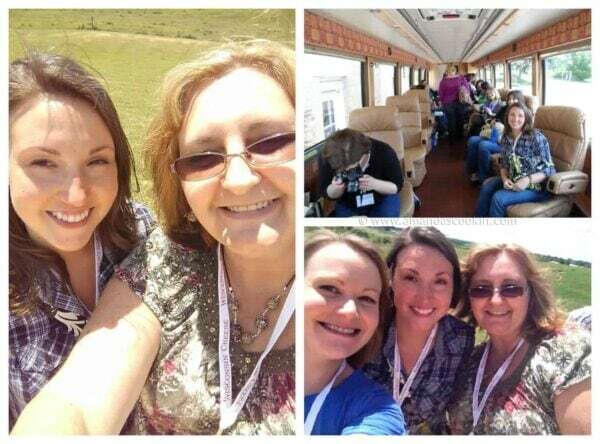 What a fun trip!! I love how blogging has allowed us to see the other side of companies! Makes us realize there are REAL people behind it all! What a cool trip! 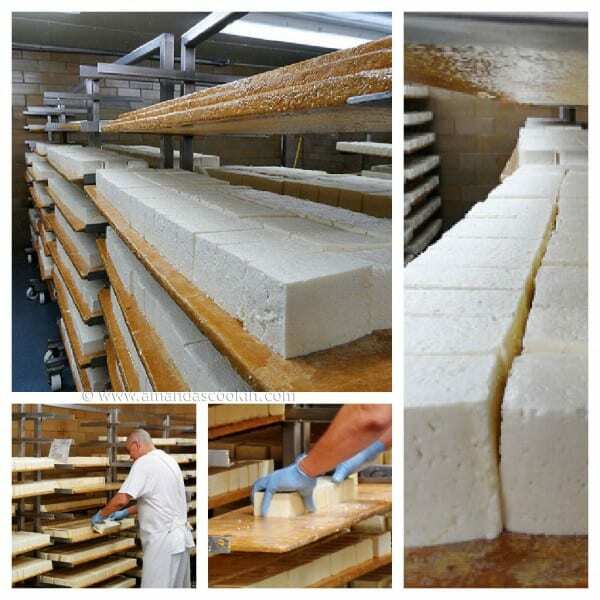 Every time we drive through we stop at Carr Valley in Mauston – we love their cheese!! !